Kofi Annan, the former Secretary-General of the United Nations, said at the Munich Security Conference this weekend that the US invasion of Iraq helped lead to the creation of the Islamic State (ISIS). 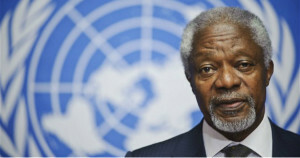 Annan began his speech by saying that the unrest in the Middle East can partly be traced back to three outside factors. He then went on to say that the modern problems cannot entirely be blamed on the incongruity of the borders set up after WWI.